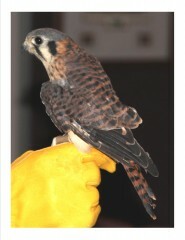 Wildlife Recovery Association ambassador birds have all sustained injuries from which they can not fully recover. 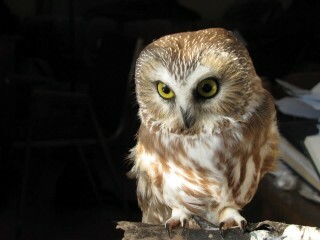 These birds are stable and comfortable, and are selected for their ability to adjust to their life in captivity. They are maintained on a natural diet and live in large outdoor housing that faces the woods and swamp. Often, wild birds of their own species stop by and exchange communications with them. They usually live long, healthy lives, and bring a great pleasure to those who see our presentations. Photographs of the barred owl, American Kestrel, and peregrine falcon are by Roger Michalski. 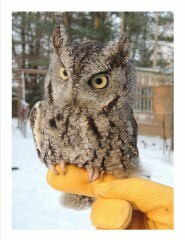 Sparkle is a grey phase Eastern Screech Owl. She intrigues the audience with her ability to rotate her head 270 degrees, and to blend in with the forest when her eyes are closed. She can look just like the bark of a tree! 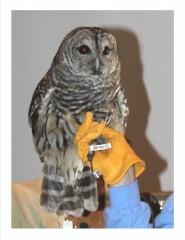 Little Red, an Eastern Screech Owl, is a favorite ambassador bird among many school children. 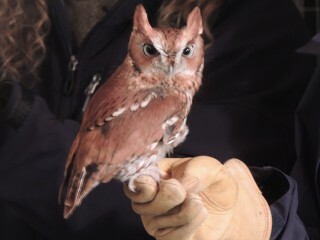 His bright color is not common, but is one of many colors possible in screech owls that inhabit natural forests. Northern Saw Whet Owl Itsy Bitsy may be one of the tiniest owls in the world, but she makes up for it with her attitude. Her species are rarely seen, as they must live in dense conifer forests and nest in hollow trees. Midnight is a dark phase Rough-legged Hawk. 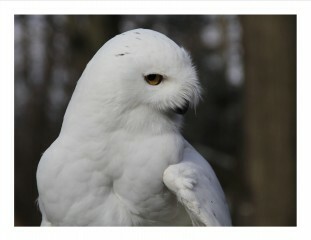 They nest in the arctic and move south during winter for easier hunting. 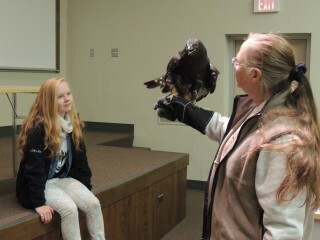 She is shown here at a special program at Central Michigan University. 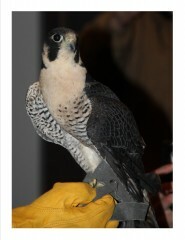 We have additional ambassador birds for special programs. We also have “pettables”, or domestic animals that children (and adults) can touch. In addition, a few of our ambassador birds are retired to allow them a few easy years at the end of their lives. They have worked with us to promote an understanding and appreciation of their species for many years.